I’m a big, big fan of podcasts. Whether it’s the Pen Addict, any of the tech podcasts I listen to, or public radio shows presented in podcast format, I’m deeply entrenched in the medium. I’ve been wanting the chance to do a podcast for a couple years now. Pencils seemed like a logical topic; trouble was, I didn’t think I could come up with enough content for a regular show. It’d hard enough keeping this blog up to date, and I didn’t want a podcast that was just an audio version. It should have something different. Enter Tim Wasem of The Writing Arsenal. He’s a relatively new blogger of scribomechanica who jumped in head-first and is brimming with enthusiasm and ideas. So when he approached me about maybe collaborating on a pencil podcast, I was really excited. We both knew that Johnny Gamber over at The Pencil Revolution needed to be involved, too, if he was willing. His experience and contacts in the pen and pencil community are unrivaled, and his mind and wit are sharper than a pencil fresh from a Classroom-Friendly Pencil Sharpener. Luckily, he was interested in joining us. 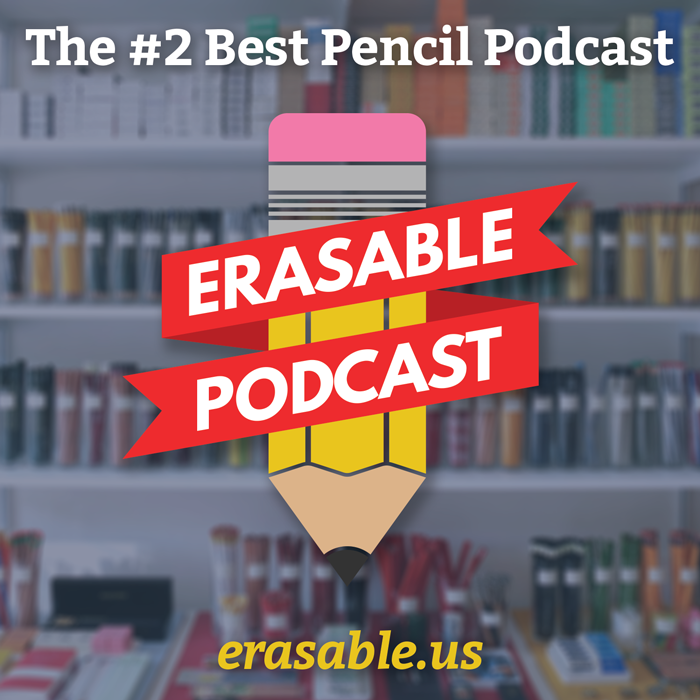 After some back-and-forth, and a trial run, we present: The Erasable Podcast! We’ve still got a lot to figure out, and as you can tell by the audio and the format, it’s still a little rough. But we’ve already caught the attention of a lot of listeners already (and the iTunes podcast directory hasn’t even approved our feed yet! So the audio’s a little rough, and we ramble about the philosophical implications of writing with wooden pencils, but Erasable is up and live with our inaugural episode! We’re starting off with some basics: our origin stories, why we started blogging about pencils, our top favorites, and the characteristics of a good pencil. We’ll be back next time with a glossary episode: the terms we use when we talk about pencils. Give us a listen, either by hitting up the website, or by subscribing directly to the feed with your favorite podcast-listening app. And we want to know what you think! Feel free to comment here, there, or via email if you have any questions or suggestions. Seriously, we’d love to hear from you. Johnny liked one of my pics on Instagram yesterday and I was so flattered since his blog got me into using pencils (along with the fountain pens I was hooked on). Your site turned me on to the Oxford Helix which I just acquired and I love. Everytime I see the logo, I want it as a tattoo. Excellent!